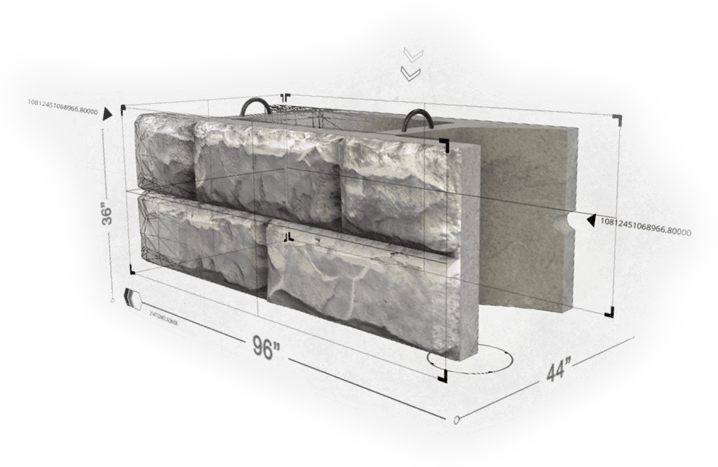 Stone Strong blocks are not just a solid mass of concrete but rather an thoughtfully designed system developed by a team of Structural, Geotech Engineers and form liner professionals from the very beginning. Their inherent size provides safety factors that are unsurpassed in the marketplace. With the biggest, best and most innovative block in pre-cast, Stone Strong Systems delivers a fully and intelligently engineered retaining wall solution with voids that align when on running bond to achieve the highest friction angle which provides the strongest course to course connection. The size of this block greatly reduces installation time and labor costs. In addition Stone Strong Provides unmatched safety, durability and aesthetics. State of the art? We go one better. This is state of the block! Our system's unique hollow cavity means less weight per square foot, which translates into reduced transportation costs and a much faster, easier, and less costly installation - install up to 1200 square feet of block a day. Huge 24-square-foot block dramatically reduces labor costs and installation time, while its sheer size and weight delivers structural strength without any need for tie-backs or additional mechanics. Lift/alignment loops ensure blocks interlock precisely and align units for consecutive level courses. Stone infill securely locks blocks together without any mechanical assistance. Innovative hollow design makes Stone Strong the only wall system in the industry to feature a fully integrated drainage system requiring no additional parts or labor. No matter the market. No matter the project. Stone Strong Systems has the block technology to meet your requirements. Subsidiary of Modern Foundations, Inc.